I am looking for ideas for simple signature blocks. What have you used? Pictures appreciated. Thank you. What about square in a square? If you go to quilters cache she has lots of blocks. Some are album blocks. I like one called antique tiles. http://www.quilterscache.com/QuiltBlocksGalore.html They are in alphabetical order. Happy hunting! I made a wedding memory wall hanging for my GD. She wanted blue and he wanted gray so I got a jelly roll of assorted blues and grays. Used a pale blue for the signatures. Ironed the pale blue with freezer paper and cut into 3 x 6 strips. Using a washable marker(crayola) I drew 2 1/2 x 5 1/2 rectangles so people would know to write inside the lines. a #5 Micron black pen worked well. Some people wrote messages and one went out of the lines. I would suggest having someone at a table to instruct the guests and make sure they don't walk off with the pen. Have 2 or 3 of them handy. 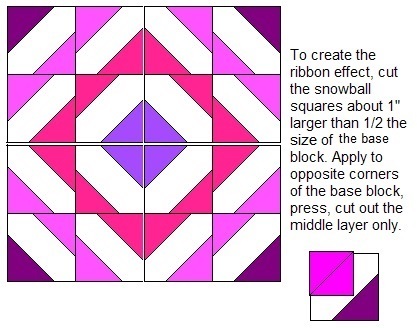 You may want to lay a picture frame mat or even a cardboard frame over the quilt block. As mentioned above, make sure writing is within the lines. You may want to include a small board with specific directions and an example. Include extra blocks in case of mistakes. This sounds like a fun project for the guests. Eleanor Burns has a free pattern called Crackerbox that I used for a wedding quilt. Easy as they make them. I used square in a square for my daughter's wedding since I wanted to keep people "in the lines". Worked well for us. Now to get to making something with them. I used the memory quilt block. Sorry I don't have a pic. It's at my Mom's. But it turned out great. i was involved in one where the square ws cut on a diagonal, the insert was white with the name, the background upper and lower were added. You might want to make all the squares so they know where to sign. I think a snowball block would work. Or just 2 corners snowballed with decent sized squares to leave a nice diagonal space to write in.